The Merry Christmas Wreaths make lovely holiday decorations for any front door. Our artists cleverly interweave the red and green velvet ribbons to make the whimsical bow. The delightful velvet bow is weather resistant. It tops off the forest fresh noble fir and princess pine evergreens. The artisans start with metal frames and use several steps to form the evergreens in to fresh Christmas wreaths. Next they securely hand tie the pine cones on to the wreath. There is a lot of fun that goes in to this wreath and it is a favorite of the Christmas Forest elves. 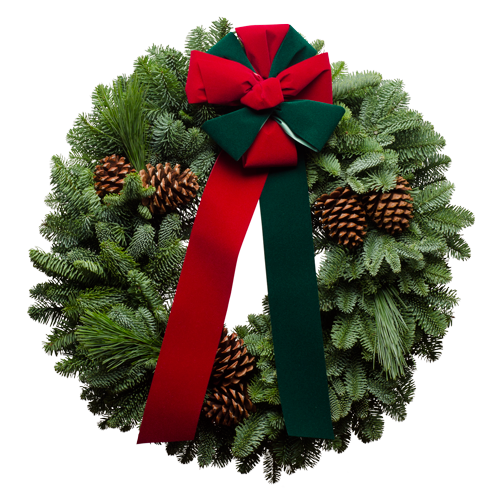 Buy one of these fresh wreaths for the merriest Christmas ever. "We have sent your wreaths to our friends and relatives for years. They await them and expect them as confidently as they expect Christmas. One recipient puts his wreath in a public work place and dozens of his fellow-workers benefit from one modest purchase. We love sending Christmas Forest wreaths. Thank you so much!"